In addition to workshops, presentations and performances hosted by the Longhouse, there are several recurring events throughout the year: the annual tribal youth art-making event, Generations Rising, the Fall Community Dinner, and December's Holiday Native Arts Fair. There are also many public events held in the Longhouse throughout the year, which are hosted by programs, faculty and student groups of The Evergreen State College. For more information on public campus events, view Evergreen's campus calendar. We have expanded our carving studio area to include a new 2000 square foot shop! All are welcome to attend this free, public celebration. Stay up-to-date with the Longhouse by visiting our Facebook page! 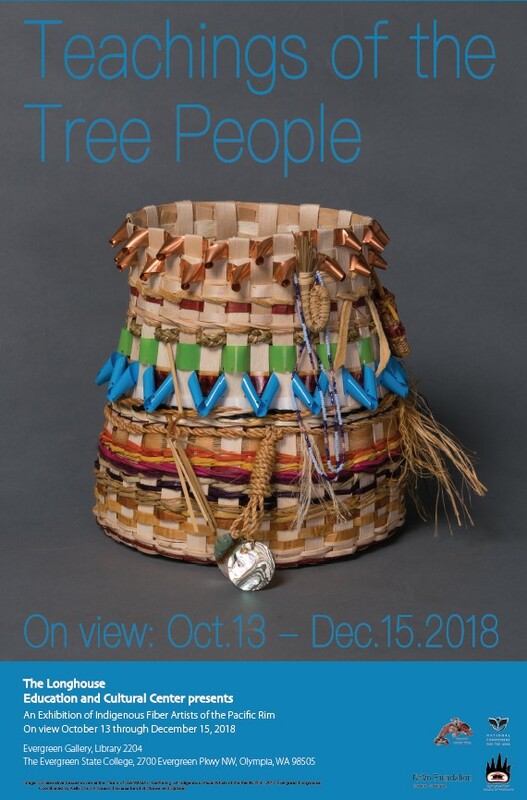 Curated by Mario Caro and Linley B. Logan (Seneca), the Teachings of the Tree People Exhibition is running October 13 - December 15, 2018 at the Evergreen Gallery. This remarkable exhibition features over 50 Indigenous fiber artists from around the Pacific Rim. 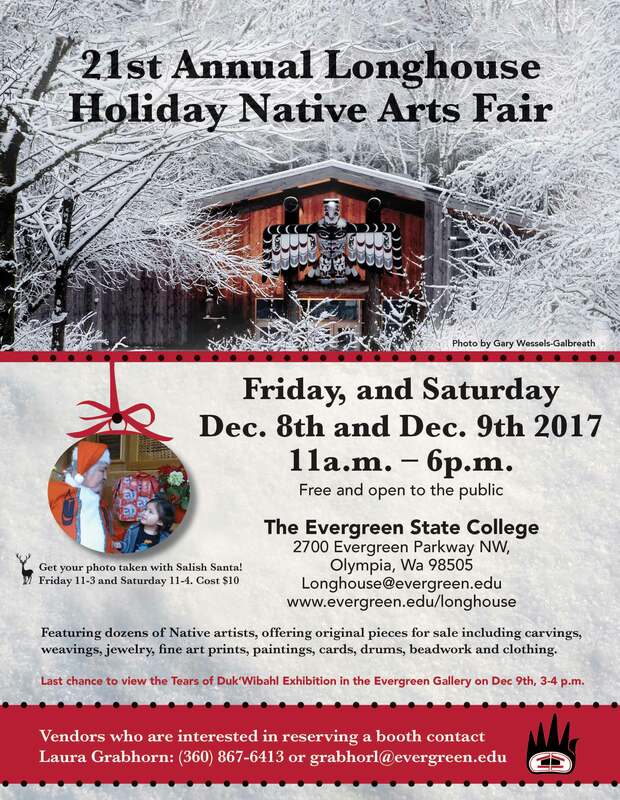 The annual Holiday Native Arts Fair will take place 11 a.m. - 6 p.m., December 7-8, 2018. This event is always a fantastic opportunity to find the perfect gift. Salish Santa will be available for pictures, 1-4 p.m. both days ($10). Our Annual Community Dinner will take place at 6 p.m. on November 17, 2018 at the Longhouse. Special appearance by "Grandma Chokecherry"
Free and open to the public! 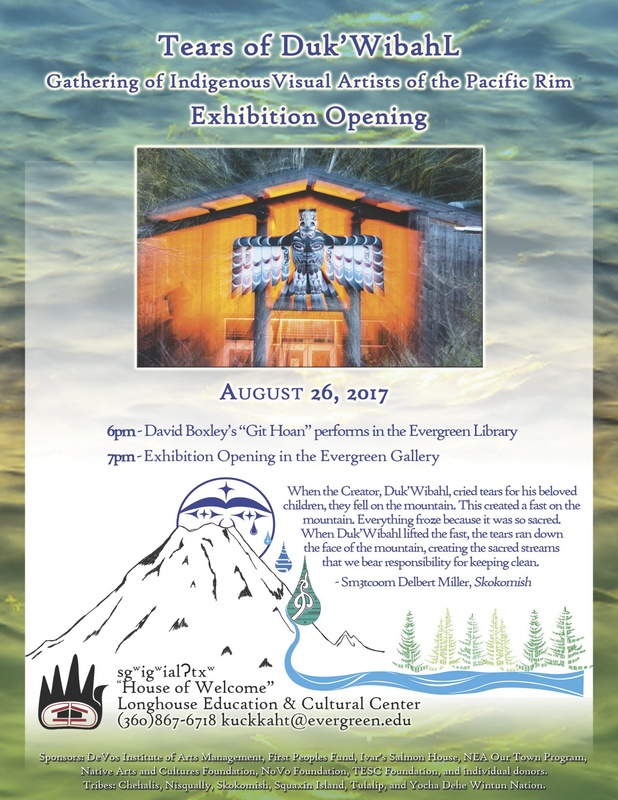 For more information, please call (360) 867-6718 or email longhouse@evergreen.edu. Mark your calendars! 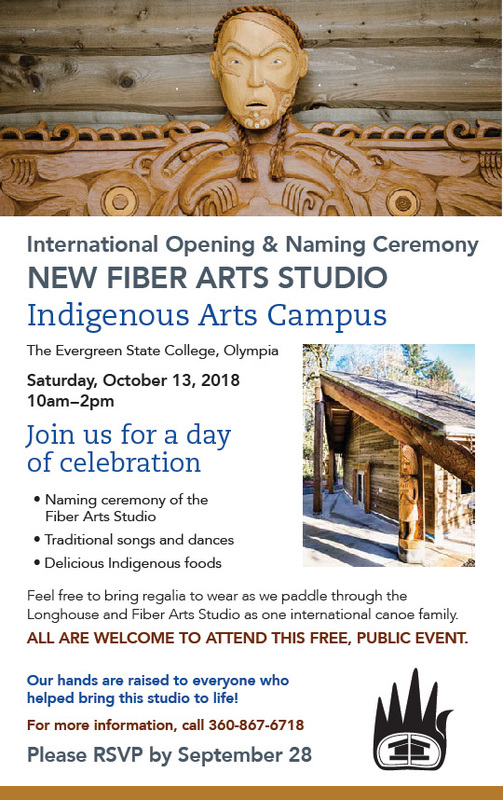 Please join us on October 13, 2018 for the international opening and naming ceremony for the Fiber Arts Studio. We will come together this fall to celebrate a tremendous step in the ongoing creation of the Indigenous Arts Campus and to acknowledge the many individuals who have contributed to the work. The international celebration and naming ceremony will take place 10:00 AM to 2:00 PM. Participants are invited to bring regalia (optional). Please RSVP by September 28. Featuring dozens of Native artists, the fair offers original pieces for sale, including carvings, weavings, jewelry, fine art prints, paintings, cards, drums, beadwork and clothing. Also on December 9: Tears of Duk’Wibahl Exhibition Curator’s Talk by Linley B. Logan, 3–4 pm at the Evergreen Gallery. 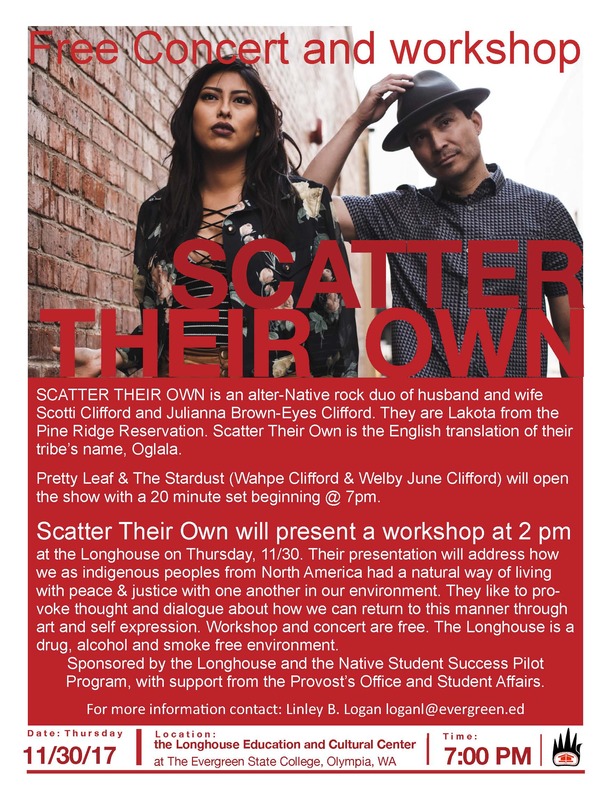 Scatter Their Own is an alter-Native rock husband and wife duo, Scotti Clifford and Julianna Brown-Eyes Clifford. They are Lakota from the Pine Ridge Reservation. Pretty Leaf and The Stardust (Wahpe Clifford and Welby June Clifford) will open the show. Admission is free! The Longhouse is a drug, alcohol and smoke free environment. 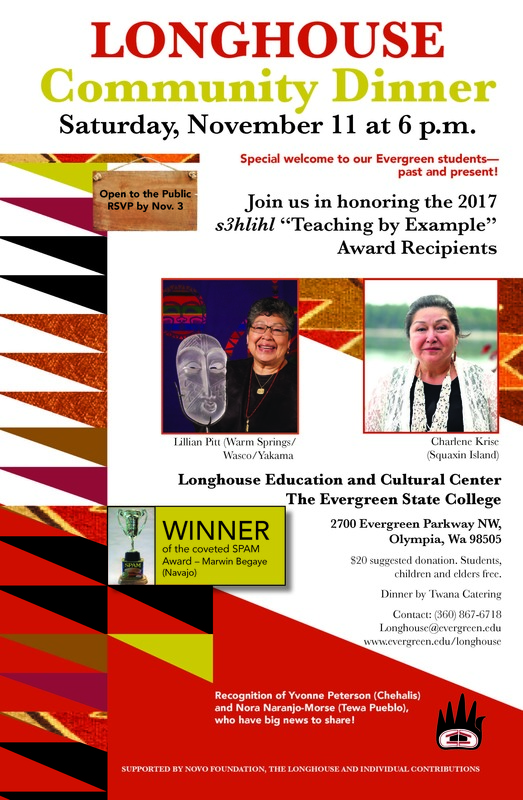 Join us in honoring our 2017 s3hlihl “Teaching by Example” Award Recipients, Lillian Pitt (Warm Springs/Wasco/Yakama) and Charlene Krise (Squaxin Island). We will also be recognizing Yvonne Peterson (Chehalis) and Nora Naranjo-Morse (Tewa Pueblo), who have big news to share! Open to the public - $20 suggested donation; students, children and elders free. Dinner by Twana Catering. Please RSVP by November 3 by calling (360) 867-6718. 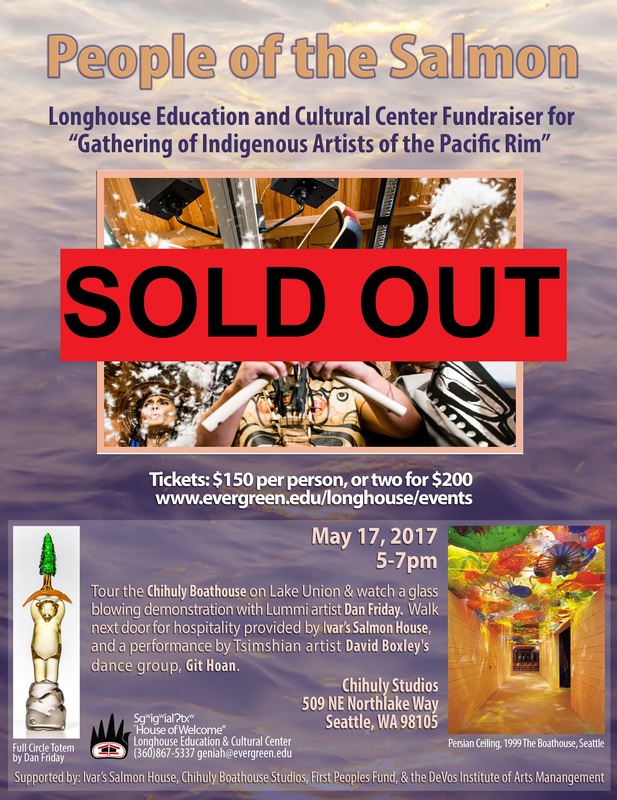 A Longhouse fundraiser for the 2017 "Gathering of Indigenous Artists of the Pacific Rim"
Space is limited, purchase tickets today! 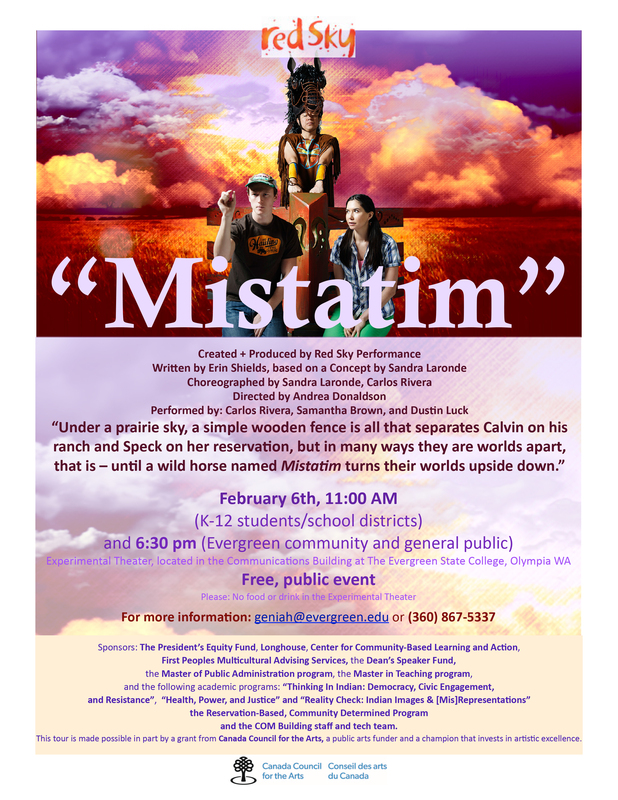 The Longhouse Presents: Red Sky's "Mistatim"
Please RSVP: (360) 867-5337 or geniah@evergreen.edu. Generations Rising: An annual tribal youth art-making event sponsored by the Hazel Pete Institute of Chehalis Basketry --flyer coming soon! 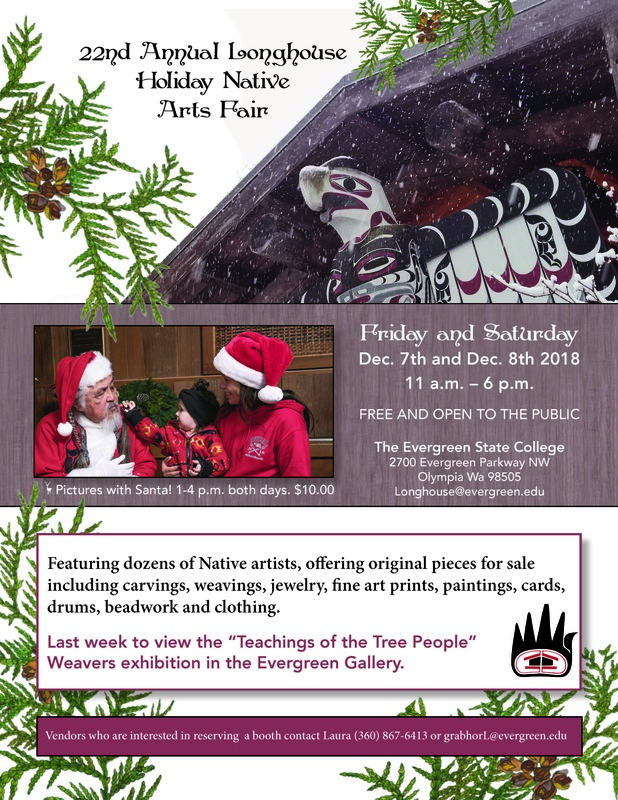 The Longhouse annual Holiday Native Arts Fair is set for Friday, Dec. 9th and Saturday, Dec. 10th, from 11am - 5pm each day. Vendors who are interested in reserving a booth can contact Laura Grabhorn: (360) 867-6413 or grabhorl@evergreen.edu. A panel discussion on the works being made for the coming Fiber Arts Studio—part of the Indigenous Arts Campus at The Evergreen State College! Featuring John Edward Smith (Skokomish), Alex McCarty (Makah), Taylor Krise (Squaxin Island), and special guest carver: Rangi Kipa (Māori)—the 2016 Toi sgʷigʷialʔtxʷ Artist-in-Residence at the Longhouse. 20th Anniversary Exhibition:"SgwigwialɁtxw at 20: Building Upon the Past, Visioning Into the Future"
Opening reception is Thursday, March 31st, from 5 - 7pm in the Evergreen Gallery, located in Library 2204. A day of cultural and performing arts workshops for youth of all ages! 5pm: "Return to the Swing" by Little Wolves Productions: Legend as drama; Native youth present traditional stories as theater. Sponsored by: the Hazel Pete Institute of Chehalis Basketry, the Longhouse Education and Cultural Center, the Lucky Eagle Casino, and the Evergreen program, "Place Memory, Narrative: Northwest Coast Literature and Printmaking"
Summer 2014 course taught by Joe Tougas and Alexander Swiftwater McCarty in the Longhouse CarvingStudio Pay3q'ali. The Longhouse's first credit-generating course held in Pay3q'ali. Lyonel Grant is one of Aotearoa's preeminent sculptors. He has designed and carved extraordinary meeting houses such as Te Noho Kotahitanga marae at Unitec Institute of Technology in Auckland, New Zealand. Lyonel will be co-designing, along with Johnpaul Jones, the Longhouse's new Fiber Arts studio which will pay tribute to our long-term relationships with Maori artists and arts organizations.This event was made possible by the generous support of Creative New Zealand and Toi Maori Aotearoa. 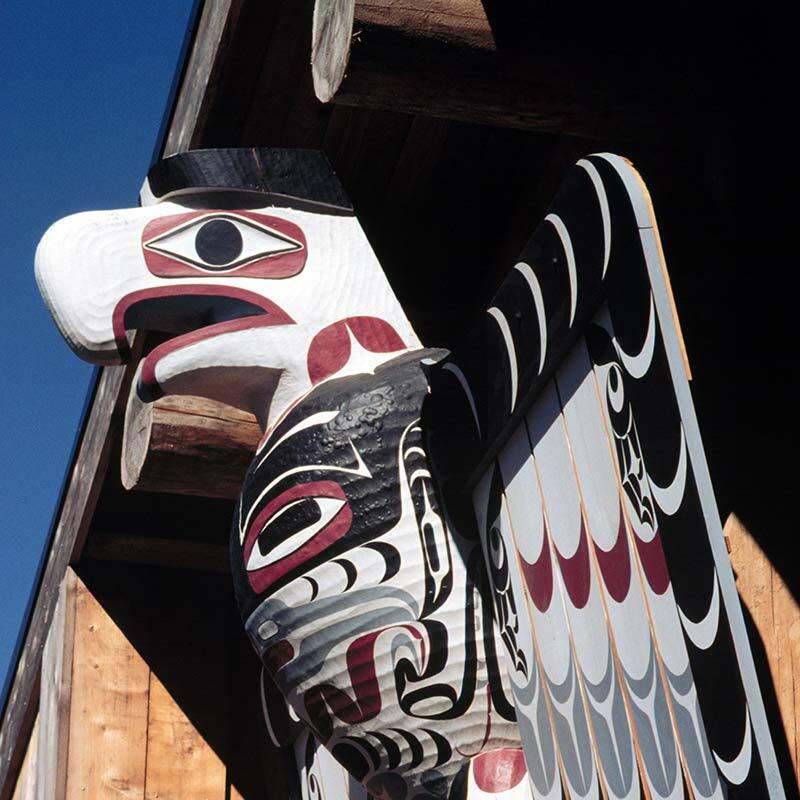 Micah McCarty (Makah), will make a presentation on the process of carving a cedar dug out canoe. View collections from the Smithsonian Institution's National Museum of the American Indian and the Yakima Valley Museum. Wade Fernandez is a Menominee musician who was named "Male Artist of the Year" by the Native American Music Awards in 2006! Workshops held in collaboration with Native Arts and Cultures Foundation. Annual Youth event sponsored by Hazel Pete Institute of Chehalis Basketry. Artist Trust 2013 Folk & Traditional Artist Fellowship winner. 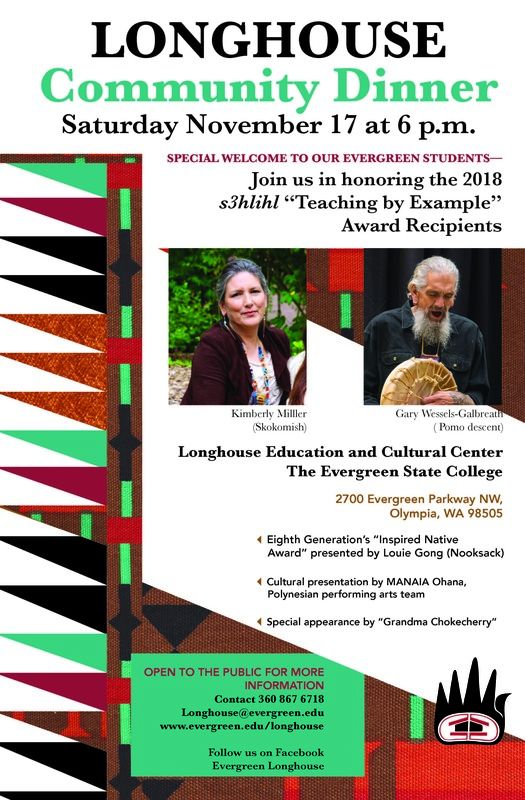 This year we will be honoring two esteemed members of our community with the S3Lhihl Award, "Teaching by Example": Karen Reed (Puyallup and Chinook), Master Weaver, and Florentino "Tiny" Barril (Tlingit), Leader of the Alaska Kuteeyaa Dancers. Sponsored by the generous support of the Native Arts and Cultures Foundation. 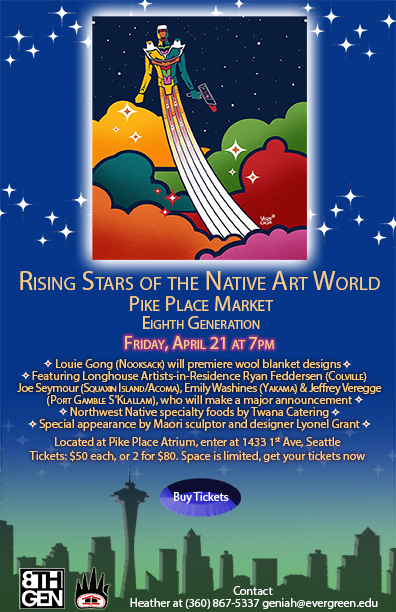 The Evergreen State Longhouse is partnering with The Wing Luke Museum of the Asian Pacific American Experience to offer a workshop for artists at The Wing. The workshop will be led by Maria Villafranca, NYFA Senior Program Officer, to discuss strategies for sustaining your artistic practice including an overview of awards, residencies and opportunities available to individual artists in Washington State and nationwide. Donna Campbell is a lecturer in Maori Creative Practice and will discuss her work in the field of Raranga (weaving). Christina "Tina" Hurihia Wirihana, (Ngati Maniapoto-Raukawa, Ngati Whawhakia, Ngati Pikiao) is the International Maori Artist in Residence at the Longhouse this summer. She is a contemporary artist, acclaimed in Aotearoa (New Zealand) and internationally for her weaving which incorporates a mixture of customary and contemporary practices. July 31st lecture at the Squaxin Island Museum and August 3rd lecture at the Evergreen State College Longhouse. Master Inupiaq carver and sculptor, Larry Ahvakana collaborated with Inupiaq artist, Sean Gallagher to build an umiaq at Evergreen's new Carving Studio "Pay3q'ali." The umiaq will be ready to participate in the Tribal Canoe Journey to Bella Bella in the summer of 2014. Bentwood Box Drum Class with David Boxley Sr.
Time: Saturday: Grand Entry at 1p.m. and 7 p.m.; Sunday: Grand Entry at 1p.m. The Native Student Alliance and Punk Rock Preservation Society present: Native Punk! Screening of the Photo Movie "A Season in the Rain"
s3hLihL "To Teach by example"